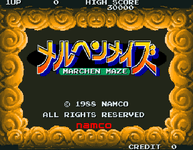 Märchen Maze (メルヘンメイズ?) is an arcade game that was released by Namco in 1988. It runs on Namco System 1 hardware, and was later ported to the Sharp X68000 and TurboGrafx-16 platforms. It is based on the story by Lewis Carroll titled Alice in Wonderland. In fact, there is a rumored English version of the game titled "Alice in Wonderland". Later, a company name Yujin released gashapon figures of Alice and Time Usagi the White Rabbit as part of the "Namco Girls" collection. In Märchen Maze, the player must take control of Alice who walks over scrolling platforms and knocks enemies over the edge with her bubble blower. Holding the fire button down generates bigger bubbles. The enemies fire marbles at her which can cause her to fall over the edge unless they are avoided or jumped over. The game also features voice samples in Japanese. Source: Wikipedia, "Märchen Maze", available under the CC-BY-SA License.